In this post, we start with an overview of "Figure Classification" question types. We also provide a sample question, accompanied by tips and strategies that student can use to perform successfully on "Figure Classification" questions during the official CogAT® exam. Figure Classifications are part of the nonverbal battery on the CogAT. Figure Matrices, and Paper Folding are the other two subtests in this battery. Figure Classification Questions: What To Expect? Students are given three figures and must select a fourth figure to complete the set. ‘Classification’ questions assess a student’s ability to identify what does not belong among a group of figures. A student has to evaluate differences and similarities among the items in order to correctly answer the question. These questions test a student’s ability to identify and classify common objects into basic categories by one or more common physical property or attribute. How Many Figure Classification Questions Are On The Test? The amount of figure classification questions on the test depends on the age of the student and the test level, as shown by the table below. The CogAT Form 7 levels reflect the age of the student taking the test, so, for example, Level 5/6 is taken by five and six year olds in Kindergarten, and Level 9 is taken by nine year olds in third grade (and so on). **However, we always recommend asking your school/school district which level of test is used for gifted or classroom assessments. 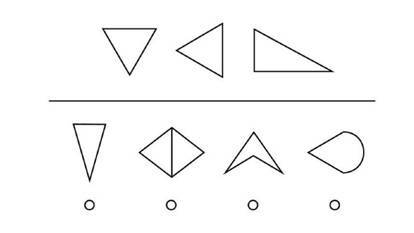 The only shape in the second row that fits the category "one triangle" is the first picture in the second row, which shows a triangle. Encourage your student to expand on his knowledge of a category in a question. Ask him to name or draw other objects that share the same characteristics and belong to a specific category. Learn more about other nonverbal question types on the CogAT, including Figure Matrices, and Paper Folding. Also try some sample questions and see critical teaching tips that cover other areas of the CogAT, including the verbal battery, and the quantitative battery.